Long-distance relationships, especially the romantic kind, can be tough. Partners miss a million lovely little things while they're apart, with the perennial act of kissing leaving one of the largest and most irritating gaps. 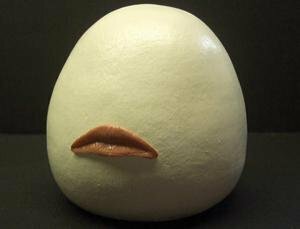 But what if you could close that gap with the assistance of a pair of robotic lips stuck to a giant plastic egg? That's right - that thing to the right is a long-distance kiss simulator. The lip-egg is none other than the "Kissenger," a long-distance kissing solution developed by Singapore-based tech firm Lovotics. Armed with two of these babies and an internet connection, anyone with lips can attempt to simulate mouth-based romantic moments of the family-friendly variety from anywhere in the world. Apply your lips to your lip-rock, and the lips on its partner rock will use clever robotics to mold themselves into a facsimile of what your lips are doing. If you're still not convinced, you can watch a video of the love machine in action right here. "People have found it a very positive way to improve intimacy in communications with their partners when they are apart," said Lovotics' Hooman Samani, adding that he is not interested in "sexual uses for [the Kissenger]." Thankfully, Samani also indicated that the device pictured is still just a concept (though whether it stands as an improvement on previous iterations of the Kissenger, which featured googly eyes and fluffy ears, remains to be seen). According to him, no Kissengers will be unleashed on the public until "all the ethical and technical considerations are covered." "The main aim is to improve long-distance relationships. We've taken several steps to minimize the creepiness," added Samani. Whatever you say, dude. While the Kissenger is an admirable concept, it's just...I mean, look at that thing. Although the other most notable attempt at designing a long-distance kiss machine wound up looking like a pencil sharpener with a straw shoved in one end, at least it couldn't frown at you. Or who knows - maybe that's a good thing. Maybe once these things hit the market we'll discover that the technology behind them works well enough to genuinely deliver the feeling of a kiss across distance, resulting in improvements in mood across the globe. How could that ever be a bad thing? In that spirit, go kiss someone you love for the fun of it just now if you're able. And when you're done, don't forget to thank whatever spirits or stars you like best that you didn't have to do it using Mr. Potato Head's faceless cousin up there.